Included: An English speaking driver who is your guide, car rental, all fuel, toll fee, parking fee, pickup and drop off at hotel. 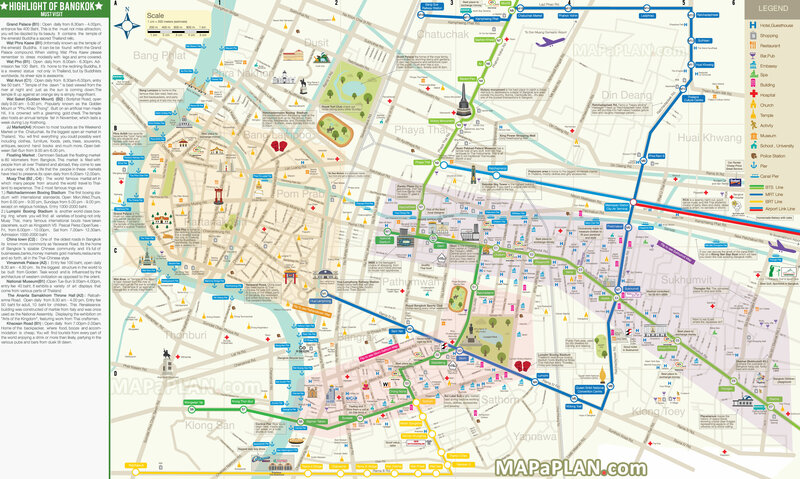 This is the most popular Bangkok itinerary. Today you will experience the most important/popular places of Bangkok to learn about all culture, art, history, and Thai way of life. Everyone prepares to dress politely with long pants and appropriate shoes. For woman, be sure the clothes to cover all upper part of your body. Otherwise it is not allowed to enter the palace and royal temples. 09:30 Wat Saket, Golden Mountain temple (50 THB/person). This is the most important place you will be closed to the Buddha, the most highly respect icon. Because there are the relics containing inside. And it is good to look from top of the mountain to Bangkok city down. 13:00 Grand Palace and the temple of Emerald Buddha Image (entrance fee 500 THB/person). This is the second most important place belongs to the King. It's full of Thai art and culture. 15:00 Wat Pho or the Temple of Bodi Tree (100 THB/person). Just 10 min walk behind the Grand Palace. It's the most popular historic temple in Thailand. This is the first Bangkok university. 16:00 Wat Arun or the Temple of Dawn (50 THB/person). Just cross the river by ferry to the historical landmark monument tower, the icon of Bangkok. Option: 17:00-18:00 Jim Thompson Thai House (100 THB/person). This is the most beautiful original and traditional Thai house. Today and other additonal days, you can select your own attractions. In Bangkok, it is highly recommended to have a guide with you if you'd like to visit some important places such as The Grand Palace, Wat Pho, and Wat Arun all the same day. This is because if you want to have a lecture, learn, discuss, and understand Thailand history or way of life. Or you'd like to discuss with someone who is a Thai and knowledgeable. Other shopping places, it is very convenient you can go yourself by BTS metro sky train by booking your hotel near a station. Please use www.google.com and www.youtube.com to find information about the places named and listed below together with www.google.co.th/maps to find locations. This is the fist place you should go when visiting Bangkok. The building inside is the most important. There is a building inside which is the oldest one, 250 years old. Entrace fee: foreigner 500 THB, Thai is free. Open time 9-15:30 o'clock everyday. It is good to have a guide with you to explain about history and culture of this place with you. Wat Pho (Temple of Reclining Buddha) This is located behind the Grand Palace, just 5 minute walk. And usually it is a must see in afternoon after morning visiting to the Grand Palace. The highlight is seeing the biggest reclining buddha that is the posture when the buddha die. The image which is built to recognize and remind us that there is a word NIRVADA which is the state of the most happiness mind if we practice well. This is the most popular temple in Bangkok which used to be the first university. The entrance fee is 100 THB. Open time 8-16. Let's have a try, Thai body massage at Wat Pho is well known. And it is supposed to be the best. This is the first, orginal, and traditonal one. The servie charge is 350 Bahts/hour. It is near the Grand Palace. It is recommended especially when you have afternoon enjoying coffee sunset time to see this tallest pagoda from the other side of the river. Open time: 08:00 -17:30. Entrance fee: 50 THB. Thonburi Canel Cruise by Long Tail Boat - If you are interested, this is recommended late afternoon when you already visit the Grand Palace, Wat Pho, or Wat Arun. The pier to the boat is near. The fee is 1,500 Bahts/boat which contains up to 10 people and the trip is 2 hours. You will see the view along Chao Phra Ya river and canals of Thonburi. TUK-TUK Riding - Tuk Tuk is a traditional old Thai-style 3-wheel motorcycle taxi dating back to 100 years ago before today conventional taxi in Bangkok. This is a famous picture of Bangkok. If you'd like to experience, it is recommended when you visit the Grand Palace. It is usually in front of the Grand Palace. You can ride from there to nearby area e.g. Wat Pho, Khao San Road or the Golden Mountain Pagoda. The price is just 50-100 Bahts for 5-10 minute ride. Because this is like all kinds of shopping centers in one place. And travel is quite convenient because there is a train around the market. It is another popular place. Chatuchak Weekend Market has a total of over 8,000 commercial panels, divided into 27 projects. The product categories are divided into 8 main categories: vegetables and fruits, clothing, pets, trees, cooked food, fresh food and miscellaneous. Time to open - Chatuchak Weekend Market. Chatuchak Weekend Day Time Market Open 10.00 am. Closed 18.00 hrs. Chatuchak Weekend Night Market (Friday) from 8pm, it has started to sell it. The peak period is from 1:00 am until around 7:00 am. ChangChui is the first creative space in Thailand that consists of event spaces, art galleries, restaurants, live house, cafes, bars, weekend flea markets, selected stores, antique stores and spaces for street music and shows, barber, auditorium, theatre, and documentary cinema. A modern, new, and quite shopping mall. There is a must see show, Himmapan Avantar show [Youtube]. The mall opens from 10 am - 8 pm. This shopping center is supposed to be the best shopping place in downtown Bangkok. It is big and splendid. Khao San Road - Khao San Road is a world famous night life street of back-up tourists. There are many pubs, bars, restaurants. The main activity is to talk around and have a dinner with some beer. Every Wednesday night, MBK Shopping Center will be the venue for MBK Fight Night, where Thai boxers from all over the world will come to each other to compete in Thai boxing. On the boxing stage outdoor The entrance to the shopping center and the opportunity for people to visit and cheer together. With the atmosphere of fighting. The voice of boxing and professional critics. Pretty girl holding a sign on a boxing ring. Light and color on stage It makes you feel like you're watching a boxing match. You do not have to pay anything. For those who are looking for a chance to watch the authentic Muay Thai fighting style, MBK Fight Night is one of the last answers that you can fill your breathtaking journey with. How to Get There: On the first floor at MBK, 18.30 – 20.30. It is free of charge. Take BTS Skytrain at National Stadium Station. Siam Discovery Shopping Center - Clothes, Fashion, electronics, and mobile phones especially the items for teenagers. Another word to call is Siam Center. It is near Siam Paragon and Central World. Platinum Fashion Mall - Mega shopping mall about cheap and high quality clothes made in Thailand. It is near Central World by walk. You can view the sky to see and go almost every where in Bangkok with metro. Golden Mountain Pagoda - Wat Saket or the Temple of the Golden Mount, Bangkok. It is good to be at the top to look Bangkok view from sky. This place used to be the military base of King Rama I, 250 years ago. It was the first formal temple built in Bangkok. Later on, King Rama III did order to build this temple 200 years ago until it was complete 50 years later. It is built to be big and tall to show how the king had great respect to the Buddha. This is the most sacred place in Thailand because at the top of the golden pagoda contains the Buddha's relics, the most respected object for Thai people. It is believed that if one gets closed and pay homage to the relics, he will be in heaven. Moreover, there is the first big golden standing buddha image aged 700 years inside. This is the China town shopping street to buy gold and jewellery in day time and at night there will be food shopping street. It is recommended to come here at night to test cheap Thai and Chinese street foods. Viamanmek is the summer palace in european style built in King Rama V 100 years ago, today opened for public. This is a half day trip 3-6 hours. There is a free traditional Thai fighting and dancing performance. The admission fee is 500 THB/person. But If you have a ticket bought from the grand palace, it is free of charge. This is the tallest building in Bangkok. It is worth if you'd like to see from top and look down all Bangkok city from sky. Dream World Amusement Park - [video] A disneyland like amusement park. The entrance fee is 500 Bahts. Please go early in the morning, you will be able to play all devices. Do not go on weekend because there will be a lot of people which wasting time in queue. Dinosaur Planet www.dinosaurplanet.net[youtube] Open hr 10 am - 5 pm. Ticket 600 THB/person, child 400 THB/person. “Dinosaur Planet” is more than just an entertainment destination. It is complete edutainment center in ASEAN. Perfect for all the family members. “Dinosaur Planet” will take you back in times to the ancient world of dinosaurs, where they’re come back to live. Visitors can experience various types of dinosaurs and enjoy exciting presentation techniques, memorable activities, and world-class performances. Children Discovery Museum Bangkok [Photo][video] This is own government place for public. The outdoor and indoor playground for children. It is the best place for children aged from 1-10 yr old. Entrance fee is free of charged opened from 10-17 o'clock. Siam City Park https://www.siamparkcity.com/en/main.php[youtube] Open hr 10 am - 5 pm. Ticket 900 THB/person, child 400 THB/person. Siam Park City is a world-class amusement and largest water park in suburb District of Bangkok, Thailand. The public park opens daily in central downtown Bangkok. The entrance is free. This is the only open public park in downtown Bangkok. [youtube] Open zoo which you can drive your car inside to see and close to animals and also tigers and lions. There are also several free animal shows all day. This is a hugh place to see and a lot of things to do. Please go very early in the morning. Entrance fee: foreginer 1,200 THB/person, Thai 580 Bahts. Links to photos. Terminal 21 - A 9 storey mall with a theme in the airport look like. Each floor is designed to become a major city from around the world. There is landmark for each of the cities you know, such as London, Tokyo and San Francisco. There are various shops. Collectibles There are many restaurants and stalls for you to choose. The most important is that you can walk throught the beautiful architecture and the interior of the department store. How to get there: By BTS Skytrain at Asoke Station Or by subway At Sukhumvit Station. Bangkok Planetarium - Space and science museum in Bangkok. The ticket is very cheap. There are just a few people and it is quiet. You should reach this place at late noon 5:00 pm. to enjoy sunset and seafood meal at the restaurant located at the end of the bridge. It is popular and allowed to fee several seagulls. The best time going there usually in November-February because the birds immigrate from the cold weather in China to Thailand warmer at that time. Let's move out of Bangkok a little bit headed to Bangpoo. It is the place to watch the sunset in the most beautiful winter. And near Bangkok, tourists can enjoy the view of the sea. And green mangrove forests. The birds are water bird species, such as birds, peacocks, birds, birds, white glasses, but the most outstanding is the gull. It will float on the sea surface at the scenic spots. I fall in the late afternoon when the sun is golden. Prepare to fall into the sea. Many seagulls will fly at the scenic spot. Create a beautiful atmosphere and relax. And here it becomes the sunset in the popular winter of the town. Bangkok Butterfly and Insect Park - It is a building that exhibits and cultivates butterflies and insects of various size on the area of ​​6 acres with a natural landscape. It consists of various plants, streams, streams, small waterfalls, as well as vegetation of butterflies. Inside the building is a show about butterflies. The cage exhibits a butterfly with a life size of 1,168 square meters open to visitors without paying entrance fee. Every Tuesday - Sunday from 8.30 am - 4.30 pm Closed Mondays opened in late 2004. Community Recreation Railway Park - There are various recreation activities available. There is a children's pool with a fountain. Enjoy the service open from 6 am to 8 pm. Camping is a place for outdoor activities and camping for young students. Great Forest Park in the City - It is a forest park modeling the ecology of the forest to do activities of nature education. To learn Can take pictures. Sports Center Wachira Benjathat - The building is in the area of ​​30 rai, which is the center of various sports and fitness such as fitness room, swimming pool, yoga room, tennis court, futsal court and other services such as room Shower, dressing room The construction of the policy of Mr. Apirak Kosayothin Governor of Bangkok. It is the first fully integrated sports center in Bangkok. Officially opened on May 9, 2006, using the services of this section. The cost of maintenance is 40 baht per year. The Archives of Buddhist Sutta Inthanin or Suan Mok, Bangkok - It is a branch of Mokkaparam garden. Dhamma practice and research. Created by the Buddhist monks, Wat Pho Noi using construction budget of over 160 million baht, began construction in 2005, officially opened the first day on August 1, 2010. Bangkok National Museum - The place is near the Grand Palace just 200 meters. The entrace fee is free. It is good after visiting Wat Phra Kaew temple. There are several old valuable things in the old days of Bangkok: Buddha images, royal utensiles, etc. Siam Niramit - Large Stage Thai Cultural Traditional Dancing Show - There is a hugh spectacular show of all Thai dancing shows in one with over 150 actors and actress. But the ticket is quite expensive at 2,000 THB/person. The show starts at 20:00- 21:30 o'clock. But please arrive there before 18 o'clock to have free international buffet dinner, to see outdoor performance, activities, the Thai style village, and senery around. Please see this review video. Meditation Course at Wat Mahatad Temple near Grand Palace - If you are in Bangkok for several days. If you feel yourself in sad emotional sometimes or having mind tension due to your daily life work. And you have never practiced how to peaceful mind meditate. As the Buddha teachs that with this often practice, it will be the path way to nirvada, a state of peaceful mind with absolute zero suffering, but with fully happiness forever, that there will be no reincarnation again. It is the way to get out of suffering. It is the method to relieve tension as studied by western medicine study. Here is the original place dated back to 250 years ago since the beginning of building the temple. There is a course everyday in English taught by monk in the temple. Importantly, it is free of charge. Marble Temple - Wat Benchamabophitr Dusit Wanaram. The temple of King Rama V is a royal monk class. The ancient temple called "Wat Laem" or "Sai Thong" has been renovated. Later, King Rama 5 expanded Bangkok. Buy land at Samsen canal. In the north of the dilapidated Wat Phra Kring Please give her HRH Princess Chulabhorn Narisara Nattawatwong. He presided over the royal palace in 1899. In the year 2444, King Rama V performed the foundation stone laying ceremony of the Ubosot. The marble was ordered from Italy and in 1910 he died before construction. In the reign of King Rama VI, please continue and summon the monk in the King Chulachom. Head It is placed under the gable of Buddha in the temple. The world largest golden buddha image weight 5.5 tons at Trimitre temple near China town, ticket 50 THB/person. Klongrad Mayom Floating Market - the nearest floating market in Bangkok. Open only on weekend 9-16 o'clock. There is a boat cruise service 5-10 seats at 500-800 THB/boat. The story of the immortal film was made several versions. It is a classic floating market. Sansabai Canal Khwan-Riem floating market Bangkok Floating Market Do not miss it. Khwan-Riem floating market This is a floating market in the middle of the city. Both sides of the temple between the temple of the North, Serithai 60 and Wat Bang Peng Nong Ramkhamhaeng 187 with a bridge connecting Wat BumNen North and Wat Bang Peng Tai South This is the first floating market with two bridges connecting the two sides of the canal. The highlight here is to remember the old atmosphere. Rattanakosin Times The atmosphere of Thai life. The monks on the boat every Saturday - Sunday listening to the Thai play and play. The river has a long history. And shady. In the market are both delicious and used to try to shop as many souvenirs. There is also a small zoo for children. Museum of Suan Pakkad Palace Located on an area of ​​6 rai, on the Ayutthaya Road, Bangkok, consisting of 8 ancient Thai houses. The first house is connected to the second, third, and fourth houses, which are to the south, respectively. The latter houses are located 5-8 west. There is a writing tower on the south side. Created in the reign of King Narai the Great. There are watermarked images of Buddhist history. The Ramayana and the events of Louis XIV sent a French envoy into the reign of King Narai the Great. At the 2nd floor of Silpakorn University - Pantip. Ban Chiang Museum Ancient artifacts of about 4,000 years, such as pottery, glass beads, glass beads found in the Northeast of Thailand. The fist big red light district area in Bangkok where there are a lot of girls, pubs, go go bars. You can come here to drink some beer and see some girl in bikini dancing show. Moreover, there is night market along the walking way where you can also shop there. The red light district in Bangkok where there are a lot of girls, pubs, go go bars. You can come here to drink some beer and see some girl in bikini dancing show. Moreover, there is a Terminal 21, a big shopping center nearby where you can also shop there. The newest red light district in Bangkok where there are a lot of girls, pubs, go go bars. If yes, then FOR Designs visit http://www.axiomasterisk.com & Reply This E-mail. Price depends on quantity and Customization. So we will provide you best bottom door delivery Prices. PS: Kindly WhatsApp us On 0092-333-8711707 to make sure that you E-Mail Have been delivered us. TO UNSUBSCRIBE REPLY THIS EMAIL WITH "REMOVE" IN MESSAGE.